1.3 What Do Geologists Do? 11.1 What Is an Earthquake? 19.1 What Makes the Climate Change? 22.5 Are There Other Earths? There are two main types of metamorphic rocks: those that are foliated because they have formed in an environment with either directed pressure or shear stress, and those that are not foliated because they have formed in an environment without directed pressure or relatively near the surface with very little pressure at all. Some types of metamorphic rocks, such as quartzite and marble, which also form in directed-pressure situations, do not necessarily exhibit foliation because their minerals (quartz and calcite respectively) do not tend to show alignment (see Figure 7.12). 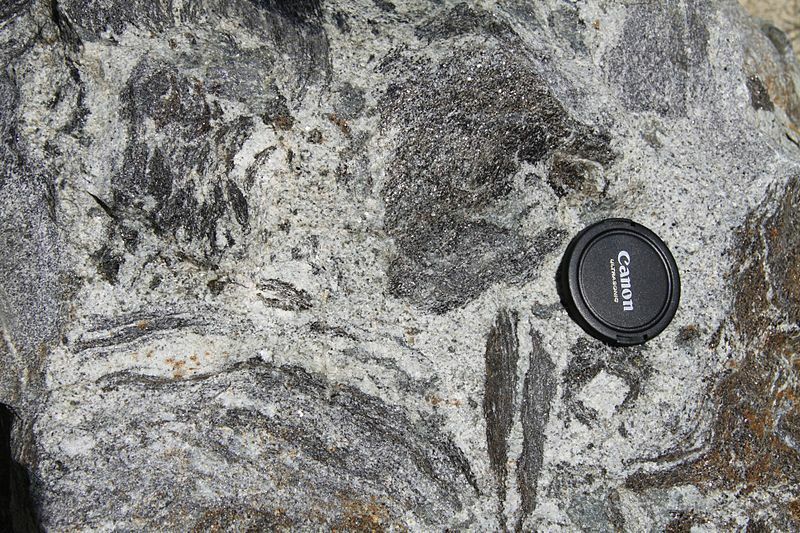 When a rock is squeezed under directed pressure during metamorphism it is likely to be deformed, and this can result in a textural change such that the minerals are elongated in the direction perpendicular to the main stress (Figure 7.5). This contributes to the formation of foliation. When a rock is both heated and squeezed during metamorphism, and the temperature change is enough for new minerals to form from existing ones, there is a likelihood that the new minerals will be forced to grow with their long axes perpendicular to the direction of squeezing. This is illustrated in Figure 7.6, where the parent rock is shale, with bedding as shown. After both heating and squeezing, new minerals have formed within the rock, generally parallel to each other, and the original bedding has been largely obliterated. Figure 7.7 shows an example of this effect. This large boulder has bedding still visible as dark and light bands sloping steeply down to the right. 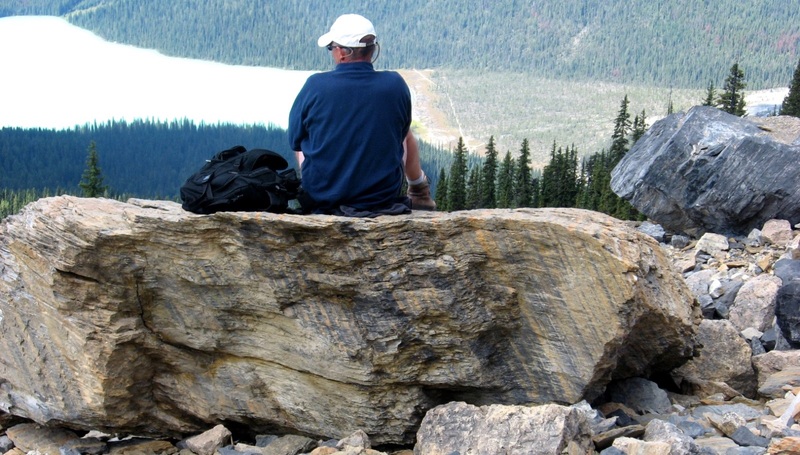 The rock also has a strong slaty foliation, which is horizontal in this view, and has developed because the rock was being squeezed during metamorphism. The rock has split from bedrock along this foliation plane, and you can see that other weaknesses are present in the same orientation. Squeezing and heating alone (as shown in Figure 7.5) and squeezing, heating, and formation of new minerals (as shown in Figure 7.6) can contribute to foliation, but most foliation develops when new minerals are forced to grow perpendicular to the direction of greatest stress (Figure 7.6). This effect is especially strong if the new minerals are platy like mica or elongated like amphibole. The mineral crystals don’t have to be large to produce foliation. Slate, for example, is characterized by aligned flakes of mica that are too small to see. 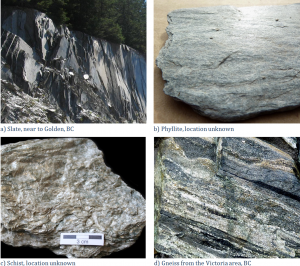 The various types of foliated metamorphic rocks, listed in order of the grade or intensity of metamorphism and the type of foliation are slate, phyllite, schist, and gneiss (Figure 7.8). As already noted, slate is formed from the low-grade metamorphism of shale, and has microscopic clay and mica crystals that have grown perpendicular to the stress. Slate tends to break into flat sheets. Phyllite is similar to slate, but has typically been heated to a higher temperature; the micas have grown larger and are visible as a sheen on the surface. Where slate is typically planar, phyllite can form in wavy layers. In the formation of schist, the temperature has been hot enough so that individual mica crystals are visible, and other mineral crystals, such as quartz, feldspar, or garnet may also be visible. 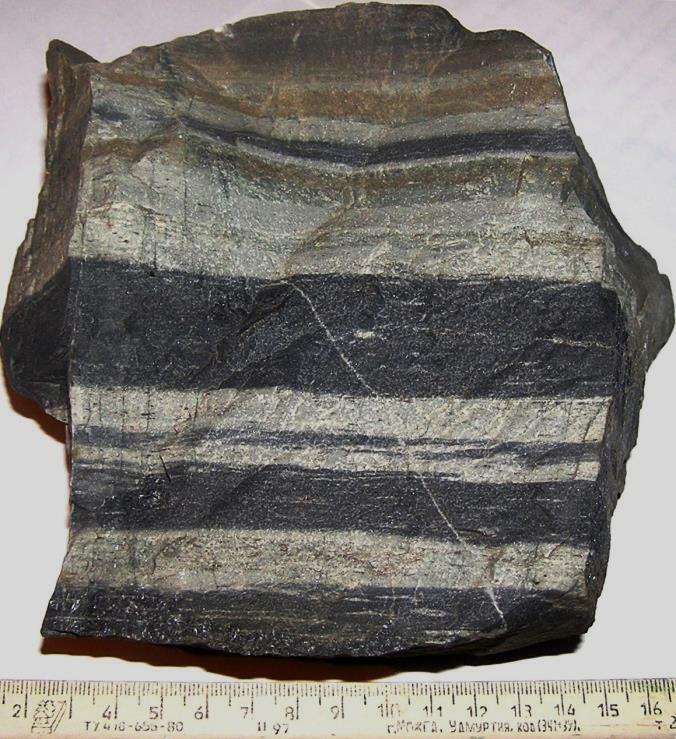 In gneiss, the minerals may have separated into bands of different colours. 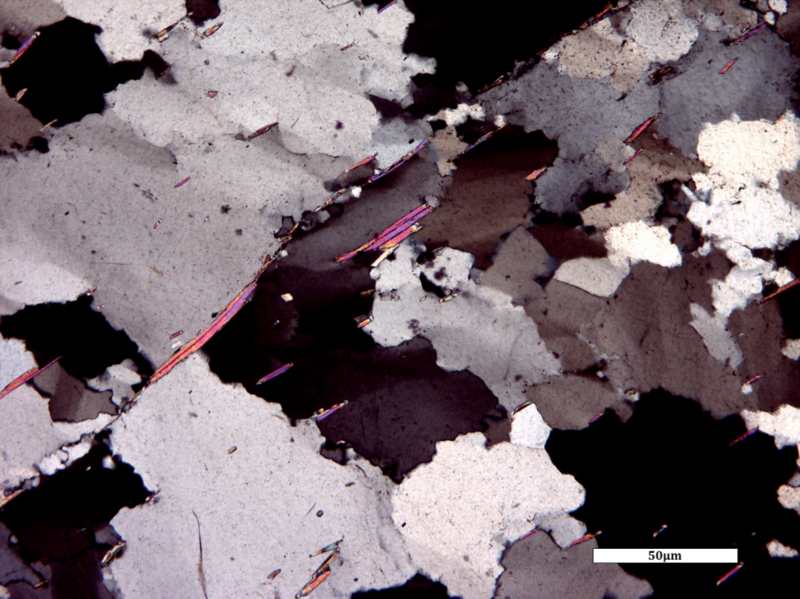 In the example shown in Figure 7.8d, the dark bands are largely amphibole while the light-coloured bands are feldspar and quartz. Most gneiss has little or no mica because it forms at temperatures higher than those under which micas are stable. Unlike slate and phyllite, which typically only form from mudrock, schist, and especially gneiss, can form from a variety of parent rocks, including mudrock, sandstone, conglomerate, and a range of both volcanic and intrusive igneous rocks. Schist and gneiss can be named on the basis of important minerals that are present. For example a schist derived from basalt is typically rich in the mineral chlorite, so we call it chlorite schist. One derived from shale may be a muscovite-biotite schist, or just a mica schist, or if there are garnets present it might be mica-garnet schist. Similarly, a gneiss that originated as basalt and is dominated by amphibole, is an amphibole gneiss or, more accurately, an amphibolite. If a rock is buried to a great depth and encounters temperatures that are close to its melting point, it will partially melt. The resulting rock, which includes both metamorphosed and igneous material, is known as a migmatite (Figure 7.9). As already noted, the nature of the parent rock controls the types of metamorphic rocks that can form from it under differing metamorphic conditions. The kinds of rocks that can be expected to form at different metamorphic grades from various parent rocks are listed in Table 7.1. Some rocks, such as granite, do not change much at the lower metamorphic grades because their minerals are still stable up to several hundred degrees. Metamorphic rocks that form under either low-pressure conditions or just confining pressure do not become foliated. In most cases, this is because they are not buried deeply, and the heat for the metamorphism comes from a body of magma that has moved into the upper part of the crust. This is contact metamorphism. Some examples of non-foliated metamorphic rocks are marble, quartzite, and hornfels. Marble is metamorphosed limestone. When it forms, the calcite crystals tend to grow larger, and any sedimentary textures and fossils that might have been present are destroyed. If the original limestone was pure calcite, then the marble will likely be white (as in Figure 7.10), but if it had various impurities, such as clay, silica, or magnesium, the marble could be “marbled” in appearance. 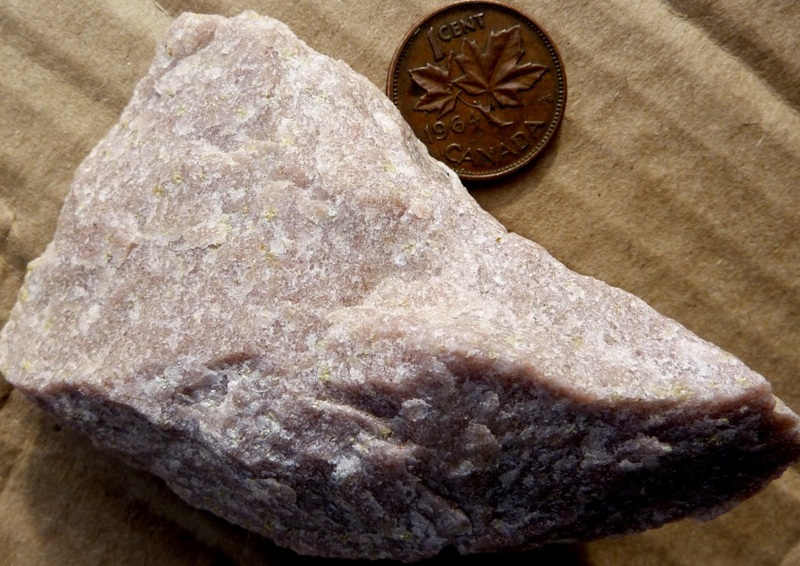 Quartzite is metamorphosed sandstone (Figure 7.11). It is dominated by quartz, and in many cases, the original quartz grains of the sandstone are welded together with additional silica. Most sandstone contains some clay minerals and may also include other minerals such as feldspar or fragments of rock, so most quartzite has some impurities with the quartz. Even if formed during regional metamorphism, quartzite does not tend to be foliated because quartz crystals don’t align with the directional pressure. On the other hand, any clay present in the original sandstone is likely to be converted to mica during metamorphism, and any such mica is likely to align with the directional pressure. An example of this is shown in Figure 7.12. The quartz crystals show no alignment, but the micas are all aligned, indicating that there was directional pressure during regional metamorphism of this rock. Figure 7.12 Magnified thin section of quartzite in polarized light. The irregular-shaped white, grey, and black crystals are all quartz. The small, thin, brightly coloured crystals are mica. This rock is foliated, even though it might not appear to be if examined without a microscope, and so it must have formed under directed-pressure conditions. Hornfels is another non-foliated metamorphic rock that normally forms during contact metamorphism of fine-grained rocks like mudstone or volcanic rock (Figure 7.13). In some cases, hornfels has visible crystals of minerals like biotite or andalusite. If the hornfels formed in a situation without directed pressure, then these minerals would be randomly orientated, not foliated as they would be if formed with directed pressure. A rock with visible minerals of mica and with small crystals of andalusite. The mica crystals are consistently parallel to one another. A very hard rock with a granular appearance and a glassy lustre. There is no evidence of foliation. A fine-grained rock that splits into wavy sheets. The surfaces of the sheets have a sheen to them. A rock that is dominated by aligned crystals of amphibole. 7.2 Classification of Metamorphic Rocks by Steven Earle is licensed under a Creative Commons Attribution 4.0 International License, except where otherwise noted.